I have been attending Day of Remembrance celebrations since 1984 when I worked with NCRR [then the National Coalition for Redress/Reparations], the Asian Student Union at SF State and APSU [the west coast's Asian Pacific Islander Student Union] to demand reparations for Japanese Americans interned during WWII. For over 27 years, NCRR [now called Nikei for Civil Rights and Redress and based in LA] and others have been using Day of Remembrance events to build multiracial unity among communities and to raise awareness of struggles for civil rights and equality in America. WHEREAS: The annual Day of Remembrance programs provide our schools and communities a valuable teaching moment of opportunity for students, parents, teachers and all people to reflect on the importance of social justice and civil liberties, especially in times of war and crisis. - To honor and remember the courage and perseverance of those who experienced this grave injustice; ...; and raise awareness of related injustices suffered by other communities (i.e. Japanese Latin Americans, German and Italian Americans) during World War II; ...To do all we can to prevent and/or speak out against similar injustices experienced by other communities, such as Arab and Muslim American communities currently; and To build cultural bridges and mutual understanding. .. While hundreds of thousands are marching in the rain in DC and San Francisco to stop the escalation of the War in Iraq the San Francisco Bay Area is hosting Presidential contender Dennis Kucinich and Carolyn Ho, mother of war resister Lt. Ehren Watada this weekend. 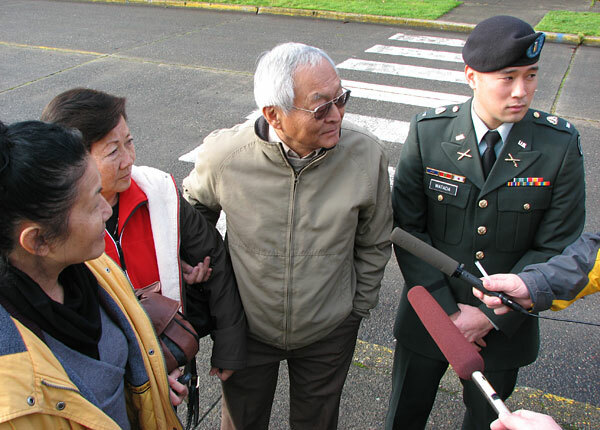 The Washington Post earlier this month ran a feature on Ms. Ho's social justice activism and work to support her courageous son Lt. Ehren Watada as his February 5th court martial date approaches. Sponsored by Watada Support Committee/APIs Resist! Sponsored by the Arab Film Festival & Watada Support Committee/APIs Resist! 7 PM: film screening, "Little Birds"
Sponsored by the Arab Film Festival & Watada Support Committee/APIs Resist! 7 PM: film screening, "Little Birds"
Their bill — which has 13 other original co-sponsors — would repeal the president's authorization to use force in Iraq and fully fund a six-month withdrawal of troops and military contractors, cutting off money after that. It also would prohibit permanent U.S. military bases in Iraq, provide economic and political aid to the Iraqi government, fully fund the VA health care system, bar U.S. access to Iraqi oil production at least until the Iraqi government sets clear rules for foreign ownership and participation, and create a bipartisan joint committee to probe whether the United States was led into this war under false pretenses. Down with Tyranny has a good rundown from BobGeiger.com with what's going on in the US Senate as well. As San Francisco prepares for our January 27th United for Peace and Justice actions to end the war [see list below] and opposition grows to Bush's war escalation plans, others like the Working Families Party in NY are urging progressive democrats and all supporters of peace and social justice to step up the pressure to de-fund and end the war. George Bush's super-hyped speech calling for escalation in Iraq was a political disaster. The American people now overwhelmingly oppose Bush's handling of the war (72%), oppose Bush's escalation plan (61%), and want to bring all our troops home in 2007 (56%). The 2008 Presidential campaign is in full swing, and the Democratic candidates want our support. Let's tell them what they must do to earn it! We are keeping track of the positions of all the candidates You can click on the name of each candidate and email our three principles. They are listening to us very carefully - let's speak up! See Bob Fertik's blog for the scorecard. From Progressive Democrats of America - Support H.R. 508! Yesterday Lynn Woolsey, Barbara Lee and Maxine Waters' introduced H.R. 508 - the "Bring Our Troops Home and Sovereignty of Iraq Restoration Act"
[the act] would establish a 6-month timeframe for withdrawal for all US military forces from Iraq, provide a framework for bringing stability back to Iraq, and fully fund the VA health care system. The proposal is a direct response to President Bush's challenge over the weekend for those who oppose his planed escalation to put forth a plan of their own. *7pm End the War in Iraq with Rep. Dennis Kucinich & Carolyn Ho. The most interesting debate for me at last night’s San Francisco school board meeting (ie until I had to leave at 9:15 PM) was over the supposedly mutually exclusive choice between spending prop H money on “violence prevention programs” ( $50K block grants to be spent as the school site chose) or academic support for teachers. Superintendent Gwen Chan argued that since the SFUSD district was now a “program improvement district” the priority needed to be “academic support” (as if violence prevention isn’t a precondition for learning). The Community Advisory committee argued for violence prevention and 4 Wellness Centers (instead of the 3 that Chan’s plan called for) as a priority, arguing that the students themselves defined that as a priority. So, two things become clear to me in this debate. One, there isn’t enough money (in a BIG WAY). Two, the local community won’t get to set the priorities – state legislatures do. These are the fundamental issues that were the pink elephants in the room last night. The debate should have been explicitly about how to do we mobilize the SF community to demand more money from the state and city (instead of arguing over the few crumbs we get from the table see ny times article, also below). The debate also should have focused on why does the community have so little say in what the educational theory and priorities are and how do we get a more democratic decision making process implemented? These issues remain unspoken. Instead, we have accepted the paradigm of inadequate funding and decision by test score alone in public debate. The small school policy debate (that followed the prop H proposal discussion) has been equally narrowed to one in which the only reason an educational reform should be made into policy is to make sure that the school system continues to socialize and sort in a legitimate fashion. It was clear to me last night that small school proponents have accepted the premise that those who don’t “succeed” in school should be blamed for their failure as individuals. Equity, according to the small school proponents last night, will exist if school success cannot be correlated to race, gender, class or neighborhood or parental income. That is, if failure can be pinned on the individual or family, then the successful can wash their hands of any responsibility for the growing polarization of wealth and its resulting social, cultural and political impoverishment (not to mention impending ecological disaster – and why isn’t Gore’s An Inconvenient Truth required viewing in the district?). Apparently it is okay if a student is damaged or alienated by the school experience as long as such damage isn’t correlated with race, class or neighborhood. Equal opportunity damage. Yeah, sign me up. The debates and presentations last night occurred within the paradigm that defines success as going to college. Let’s ignore all the reasons why the system, as is, will never let everyone go to college (which is why the RHETORICAL goal of getting the college bound to be proportional to disaggregated demographics exists). What if everyone went to college? Would that necessarily result in everyone having a decent home, health care, functional families, disposable income and world peace (would it alter the nation’s spending priorities – see article, also below)? What are people actually learning in school? How long does that learning last? 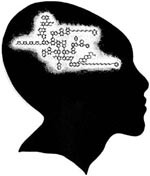 How many adults, for example, learned algebra and still know it? Is anyone learning in school how the power structure in this country actually works (as opposed to the myth of how it works)? No one is explicitly examining, debating or questioning whether qualifying to go to college is really evidence of how well one has accepted one’s role to support the status quo. …… $1.2 trillion would pay for an unprecedented public health campaign — a doubling of cancer research funding, treatment for every American whose diabetes or heart disease is now going unmanaged and a global immunization campaign to save millions of children’s lives. All that would be one way to spend $1.2 trillion. Here would be another: The war in Iraq. CARBON DIOXIDE is heating up the Earth. Ice caps are melting, ocean levels are rising, hurricanes are intensifying, tropical diseases are spreading and the threat of droughts, floods and famines looms large. Can planting a tree help stop all this from happening?. . . . While preserving and restoring forests is unquestionably good for the natural environment, new scientific studies are concluding that preservation and restoration of forests outside the tropics will do little or nothing to help slow climate change. And some projects intended to slow the heating of the planet may be accelerating it instead. . . . Consider Pacific Gas and Electric’s surcharge plan. While the carbon soaked up by California’s forests reduces atmospheric carbon dioxide concentrations everywhere, cooling Crete, Cancún and Calcutta, the sunlight they absorb warms the state and the surrounding region.. . . The broadest goal is neither to slow the growth of carbon dioxide in the atmosphere nor to slow climate change, but rather to preserve the irreplaceable natural balance that sustains life as we know it on this planet. . . . regardless of its impact on climate — we need more trees, not fewer. But the notion that we can save the planet just by planting trees is a dangerous illusion. To preserve our environment, we must drastically reduce carbon dioxide emissions, and this will require a major transformation of our energy system. From the left coast of San Francisco, earlier this month some 1000 people gathered to send a creative message to our elected officials and the world. Unlike some other beach gatherings a little to our north, I understand that folks at this one were fully clothed. The gathering was at Ocean Beach outside one of my favorite hangouts - the Beach Chalet. I also liked - AS BUSH BEGS TO BE IMPEACHED, CHENEY REMINDS US THAT HE'S... JUST AS CULPABLE. Twenty thousand more US kids, going to fight a war that can't be won. Twenty thousand more lives in potential danger for no imaginable purpose. This isn't the "surge" Bush has invoked; it's an escalation, one reminiscent of the worst days of the Vietnam War, when Presidents Lyndon Johnston and then Richard Nixon sent more and more troops into a quagmire from which there was no good exit. ...Remember: the odds are very good that many of those 20,000 soldiers will never make it home and that many, many more will come home mutilated and maimed. ...And since Bush is acting unilaterally, without congressional assent, the only way to stop this madness is to cut off funding. immediately to eliminate funding for any troop escalation. * More. The Democrats’ real problem appears to be political rather than constitutional: They have convinced themselves that they cannot cut off funds without being accused of failing to keep faith with U.S. troops in Iraq. But this is a false dilemma. Congress can force Bush’s hand without being vulnerable to the charge of stranding U.S. troops simplyby setting a date beyond which no funds can be used for U.S. military presence in Iraq. As long as the date provides a reasonable time for those troops to be “redeployed” from Iraq, the burden falls on the executive branch to adjust its policy to the congressional requirement by taking them out of the war zone. More. Speaking of war funding, whenever I bring up the war with my classes at SF State, I use a helpful economic tool. The National Priorities Project allows you to break down the cost of war - $359 billion as of today - and compare it to how much we could have spent on health care, schools, teachers, grants and college scholarships, human needs, etc. Obama Takes Bold Step - 2008 Presidential Candidacy Potential for a New Rainbow Coalition? So, it's official - Chicago's Senator Barack Obama has now jumped into the 2008 White House race. See the announcement for yourselves. The last time I remember as charismatic a strong candiate for president was some 20 years ago when many grassroots activists like me were building the rainbow coalition chapters and diverse labor/community alliances all over the US for the 1984 and 1988 Jesse Jackson campaigns. But Obama critics rightly challenge Obama's relatively shallow, but 'clean' record, while also pointing out his clearly centrist politics. Progressive friends of mine from Chicago and within the old 80's Rainbow Coalition seem to be taking a wait and see approach. How Obama's platform and campaign structure shapes up will be worth watching. And, whether Obama can build strong grassroots labor and community support like Jesse Jackson's 84 and 88 campaigns remains to be seen as well. Democratic Sen. Barack Obama (news, bio, voting record) of Illinois jumped into the 2008 White House race on Tuesday, promising to "change our politics" with a campaign that could make him the first black president in U.S. history. Obama, a freshman senator and rising party star, formed an exploratory committee to begin raising money and hiring staff to campaign for the Democratic presidential nomination to succeed Republican President George W. Bush. He plans a formal campaign announcement in his home state of Illinois on February 10. "Our leaders in Washington seem incapable of working together in a practical, common-sense way. Politics has become so bitter and partisan, so gummed up by money and influence, that we can't tackle the big problems that demand solutions," Obama said in a video message announcing his bid. 2. finding common ground with our teacher's union United Educators of San Francisco and other labor groups. Our small schools task force tonight will be presenting their findings and recommendations to the board's meeting at 555 Franklin Street [at McAllister], Board Meeting Room, San Francisco. Regular Sessions of the Board. Happy MLK Day. I appreciated this great piece from 2 longtime social justice activists from the San Francisco/Oakland Bay Area - MLK on immigration and building community among African Americans and newcomers - from Gerald Lenoir, the coordinator of the Black Alliance for Just Immigration (BAJI) and Larisa Casillas, director of the Bay Area Immigrant Rights Coalition (BAIRC). See also San Francisco activist Betita Martinez' piece on building Black/Brown unity in North Carolina and the National Network for Immigrant and Refugee Rights' BRIDGE Project: Building a Race and Immigration Dialogue in the Global Economy: Popular Education Resources for Immigrant and Refugee Community Organizers. For historical context of multiracial coalitions and community alliances see also the Institute for Multiracial Justice, an organization I helped to found 10 years ago under the leadership of Betita Martinez, Carlos Munoz, Miriam Louie and many others. For more recent efforts to build multiracial unity within grassroots communities see building-blackbrown-alliance-la-style.html. Use the power of the purse By RUSS FEINGOLD Jan. 10, 2007Keeping our brave troops in Iraq indefinitely is having a devastating impact on our national security and military readiness. 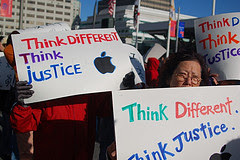 SF '07 Macworld - Think Different, Think Justice! More info @Monster Cable Workers march for justice. Great new blog by Monster Cable Workers and community supporters! On Wednesday, Jan. 10, at 12:30 pm, over 50 laid-off Monster Cable workers and their supporters marched from Yerba Buena Gardens to various retailers including the Apple Store, CompUSA, Radio Shack and then to the MacWorld Conference and Exposition at Moscone Center. Laid-off workers marched to expose the hypocrisy of Monster Cable CEO Noel Lee’s claims that he can’t afford to treat workers fairly, and call upon Apple Computers, Inc., which sells various Monster Cable Products, to tell Monster Cable “Stop being such a Monster!” More. MoveOn members had organized a number of actions during the day throughout our Bay Area as well. Indybay.org has plenty of great photos. UFPJ PROTEST JANUARY 27TH! On Saturday, January 27, thousands will be marching on in Washington to call for an end to the Iraq war. ANSWER March on the Pentagon March 17th. I am proud to be part of the Educator Roundtable, an alliance of teachers, parents, scholars, and policy analysts who have come together in hopes of repealing the CURRENT authorization of the ESEA (No Child Left Behind Act). Over 23,000 folks from all over the country have signed on to our campaign as Congress debates the reauthorization of ESEA. Thanks to activists like Kathy Emery, Susan Ohanian, Jean Anyon, Jim Horn, Philip Kovacs, Harold Berlak, Alfie Kohn and others for their efforts to build grassroots resistance to the NCLB and other conservative education policies that threaten public education. Considering the power and position of the individuals and organizations behind NCLB, we are under no illusions about the difficulty of ending this destructive legislation. While no one has yet leveled an effective, widespread challenge to the law, we are hopeful. We are hopeful that thousands of disenfranchised educators, disillusioned parents, overburdened students and broken school districts will raise their voices in protest to reclaim our free, public, and locally controlled schools. Recognizing that public schools are not perfect, we believe in education reform led by teachers, the professionals closest to our children, rather than ill-informed politicians or other representatives of corporate America. We intend to deliver 50 bills, tailored for each state, calling for an end to NCLB. At the same time, we will propose legislation seeking genuinely representative solutions to the many issues facing students and teachers across the country. To begin both processes, we ask that interested individuals sign our petition so that our legislators can begin seeing how widespread the opposition to this legislation has become. Our goal is 1,000,000 signatures, to be printed and hand delivered to a national representative committed to ending No Child Left Behind. As of today there are more than 23,000 people from all over the United States that have signed the petition in only a few weeks. Please join us - sign our petition! Harold Berlak’s primer on NCLB and CA’s testing system. Mike Klonsky's small talk also points out the weakening of support for NCLB from the conservative right as well. San Diego State's Rich Gibson also offers a useful class analysis of the strategies to address the existing NCLB. The Rogue Forum is gathering March 1-4 in Detroit to further debate the issues as well. Happening Here has an excellent post on the racist right's new "Families First" attack on the constitutional principle of Birthright Citizenship established by the abolitionist movement, the 14th Amendment, and cases like the 1898 landmark US vs. Wong Kim Ark. Mr. Wong was a young American-born San Franciscan of Chinese ancestry who successfully challenged the US governement's efforts to bar him from reentry into the United States because his parents were immigrants to the US. Leaders of the religious right -- likes of Lou Sheldon of the Traditional Values Coalition, Donald Wildmon of the American Family Association and Gary Bauer, former rightwing political candidate -- have gotten together to push one of the ugliest forms immigration restriction. By way of something called Families First on Immigration, according to the Washington Times, these guys have taken a stance in the immigration debate. No, they are not advocating welcoming the stranger or defending the rights of the alien worker in a strange land. They want a "grand compromise" that does away with "birthright citizenship." ...Immigration restriction as espoused by white citizens is too often an expression of the fear of "browning," of the demographic tide that has this country well on its way toward ceasing to have a white majority. It thrives on the fear that "those people" have lots of babies just to enable them to engulf the United States. It is sad, but perhaps not entirely surprising, to find the leaders of the religious right playing to racial fears by joining an effort led by outright xenophobes to repeal birthright citizenship. After all, pseudo-populist initiatives that both incite -- and pretend to allay -- hyped-up fears are their stock in trade. Look at their incitement of panic in response to the "threat" of full civil rights for gays. Janinsanfran was one of our leaders of Californians United Against Prop 187 in 1993/94 and a founder of Californians for Justice in 1995/96. See also Migra Matters for more on immigrant rights struggles today. Hundreds of San Francisco Public School parents attended the January 9th board meeting to speak out for equity in the school system. Parents delivered hundreds of petitions demanding that the Board ensure a strong parent voice in the superintendent search process. Our district is fortunate to have strong parent leaders like Pauline Vela [pictured above in the middle] of our Parent Advisory Council and Parent Advocates for Youth, Coleman Advocates parent organizer Sandra Fewer and Parent Voices leader Lorie Jones. Other parent leaders, including Sophia Nixon, Toni Hines, Jaime Ramirez, and many others, also spoke out and mobilized at the Board meeting. Bravo to the parents - and their new Public Education and Equity Group - who are continuing a tradition in SF, Boston, and many other cities of parents leading and organizing for a stronger public school system and a better future for our children and communities! The Oakland/San Francisco PLAN [parent leadership action network], the regional parent organizing group, is holding a parent conference next week to help build power and strengthen parent advocacy in our Bay Area school districts. At Noon today hundreds of laid-off Monster Cable workers and their supporters will be Marching for Justice at the MacWorld Conference at San Francisco's Moscone Convention Center. When I talked to one of the workers, the mother of one of my daughter's former classmates, on Sunday she told me that the workers are still organizing for a fair severance and and an acknowledgement from Monster owner/CEO Noel Lee of their years of hard work making the company profitable. After weeks of protest, “’Head Monster’ Noel Lee finally met with worker representatives during the holidays, only to tell them he doesn’t have money to offer them a fair severance or support the community that made him wealthy. Meanwhile Monster Cable is organizing an expensive star-studded awards ceremony and concert for over 4,000 people at CES 2007, the Consumer Electronics Show in Las Vegas, boasting that this annual show has “become the biggest social eventof CES in Las Vegas.” (Monster Cable press release, December 13, 2006). They hope to raise awareness about the plight of Monster Cable workers and more broadly, the issue of labor practices in the electronics industry. Currently, Monster Cable Inc. makes a number of products for Apple Computers Inc., including the iTVlink, iEZClick, iSplitter, iCruze, iCarPlay, iCable and iStudioLink, with cost up to $100 per product. On Oct. 20, 2006, Monster Cable Products, Inc. laid off over 120 production workers from their Brisbane facility, outsourcing their jobs to low-wage labor overseas to increase profits. The company is a highly profitable company which sells high end audiovisual cables, home theater equipment, etc. The laid-off workers are mostly monolingual middle-aged Chinese, Vietnamese, Latino, and Eastern European immigrants who worked an average of over 8 years and as many as 20 years for the company with an average wage of $11-$12 per hour. Laid off workers want a just severance as previous laid off workers and want the company to address their long term unemployment issues by contributing to a Community-Worker Transition Fund. In 2005, MonsterCable estimated sales of up to $300 million. As I and other San Francisco School board members work towards improving our future equity and desegregation plans for our 57,000 public school students, a number of community groups are starting to build support nationwide for our work here and in other urban centers. Last month Asian American organizations from San Francisco to New York filed a 'friends of the court' [amici curiae] brief to weigh in on the US Supreme Court's arguments in the Seattle and Louisville school desegregation cases. Coalition for Asian Pacific American Youth, Detroit Asian Youth Project, Filipinos for Affirmative Action, Japanese Community Youth Council, One Lowell, Providence Youth Student Movement South Asian Youth Action!, and United Chinese Association of Brooklyn. Civil rights groups Asian American Legal Defense and Education Fund (AALDEF) and CAA Chinese for Affirmative Action/Center for Asian American Advocacy asserted a compelling interest for the nation’s public schools to actively ensure equal access to quality education and a diverse learning environment. In both cases, locally elected school boards in Seattle, Washington, and Louisville, Kentucky had voluntarily adopted measures to reverse racial segregation in their public schools, and considered race in their cities’ kindergarten to 12th-grade school assignments. Similarly, in San Francisco, where more than 50% of public school students are Asian American, School Board Commissioners would also like to propose a race-conscious student assignment plan that would include considerations of race in a narrowly tailored manner. CAA, which joined AALDEF in filing an amicus brief with the High Court, represents Chinese American parents and children who favor such an approach. Last year I visited various Boston social justice organizations, including the Asian American Resource Workshop, Chinese Progressive Association, U Mass Boston's Ethnic Studies programs, and a progressive Asian American youth organizing group recommended by UMass's Peter Kiang called CAPAY -Coalition for Asian Pacific American Youth. CAPAY is one of the organizations that support the AALDEF/CAA brief in favor of civil rights and desegregation. I attended one of CAPAY's workshops and a summer picnic with activist supporters Sophia Kim and Gee Quach and was impressed with the dynamic organization and the young folks that make it strong. One of my former TA's Anjela Wong, now finishing her EdD at the University of Wisconsin, Madison, was a former CAPAY leader. Check out Miwa Tanabe's great feature on the work of Boston's CAPAY! It's a 'chilly' but sunny 60 degrees here in the San Francisco/Oakland Bay Area, but I wish I were in Miami this week with Mike Klonsky, Pedro Noguera, Debbie Meier and many others for the 6th Annual Small Schools Workshop gathering. Klonsky's latest blog points out the conflicts of interests with the conservative Thomas Fordham Foundation's role as both an authorizer and operator of charter schools. Foundation head Checker Finn is a former Reagan administration assistant secretary for education. ... I still can't help wondering how the Fordham Foundation, with close ties to the Bush Dept. of Education, can be both a charter school authorizer and operator of a chain of charter schools. I guess I've already answered my own question. As privately-managed charter schools increasingly become the answer to the question "where does school reform go now that school reform is dead?" the conservative think tank led by Checker Finn has obviously been doing some thinking. Why sit around and complain, as Finn often does, about the failure of charter school accountability under NCLB? Why not get into the business ourselves? So, as Edweek's Eric Robelen , who makes private management seem almost heroic, puts it, Fordham has "taken the plunge" and will operate nine charter schools in southwest Ohio, which has become charter school's version of Mecca. According to Robelen's account, the nine schools serve some 2,700 students, mostly from low-income and minority families. They run the gamut from two charters operated by the for-profit Edison Schools Inc. to a school started by a Baptist minister. Protesters also said they wanted to send a message to San Francisco Congresswoman Nancy Pelosi, who became the country's first female Speaker of the House on Thursday morning. "We're here to send a message to Nancy Pelosi. She was elected to defund the war and bring the troops home," said demonstrator Nancy DeStefanis. Thanks to Grace Shimizu of the Watada Support Committee and the Campaign for Justice for the links below. The photo above of Lt. Ehren Watada, father Bob Watada, mother Carolyn Ho and stepmother Rosa Sakanishi is from former War Resister Jeff Paterson/Courage to Resist. Finally, help spread the word about the regional mobilization at Fort Lewis on day Lt. Watada’s court martial is scheduled to begin on February 5, or organize your own local protest in solidarity on that day. We will try to post info on local San Francisco/Berkeley/Oakland solidarity events later. Photo - Parent and social justice activist Francisco Hererra at the Parent Leadership Action Network gathering in Oakland. Parent leader Lisa Schiff has a great new commentary in Beyond Chron's School Beat: Parent Voices are Part of the New SFUSD Plan. Schiff outlines how progressive school board members worked with parent groups like hers [PPS] and others like Coleman Advocates, Chinese for Affirmative Action, ACORN, SFOP and others to demand stronger, more meaningful parent voice in our district. San Francisco public school parents are typical San Franciscans. We want to be involved, consulted and listened to when it comes to issues affecting our communities and one of those issues is most certainly our public schools. Last year, in a unified voice, the community told the Board of Education (BOE) and the district administration that the difficult path through declining enrollment and insufficient budgets could only be successfully traversed if two major projects were undertaken.The first was to develop a new long-term comprehensive education plan for the district. The second was to meaningfully include the voices of parents and guardians regarding issues such as educational programs, the achievement gap, school closures, the needs of different communities and neighborhoods and more. With capacity building support from Coleman, the SF Education Fund and others we are also working towards a stronger mechanism for parental and community involvement in our upcoming Superintendent Search Process as well. Please join us for SFUSD's final set of parent/community conversations organized with help from our Parent Advisory Council, Hugh Vasquez and the SF Ed Fund, PPS and others. Tuesday January 30 from 10-11:30 am (in English) PPS-SF Office -- 9 Silliman St, Ste 6 (@ San Bruno) . SF Parent Voices leader Maria Luz Torre and 2 of my former colleagues from the Northern California Coalition for Immigrant Rights now are on the advisory board of the PLAN [Parent Leadership Action Network] - Jenny Ocon of the Parent Services Project and Christina Wong of Chinese for Affirmative Action. Debra Anderson has children at AP Giannini Middle School and Burton High School, and a son in college. She is a native of San Francisco and lives in Oceanview. She has been active with parent groups and the SSC at her children’s schools, and as a volunteer with the Young Scholars program. Charles Armstrong has children at Cesar Chavez Elementary School and the Willie Brown Academy. He lives in the Western Addition. He has been active at his children’s schools and is a member of the SSC at Willie Brown Academy. Ana Castillo has two children at Monroe Elementary School, where she has been active with the parents’ group, and lives in the Excelsior. She is a native of San Francisco but new to the SFUSD, as her older child attended private school. She is bilingual in English and Spanish. Cindy Choy has a child at El Dorado Elementary School and lives in Visitacion Valley. She is a member of the SSC at El Dorado, serves on the DELAC, is a leader of the Visitacion Valley Parents Association, and works with Parents for Public Schools. Her primary language is Cantonese. Stephanie Choy is the PAC’s Vice Chair. She has a child at RL Stevenson Elementary, one at Lincoln High, and another in college. She lives in the Forest Hills neighborhood. She has been involved in her children’s schools for years, as a parent leader and member of SSCs. She speaks some Cantonese and Mandarin. Nick Driver has two children at Alvarado Elementary and lives in the Dolores Park neighborhood. He has been involved in the school’s parent group and SSC, as well as the SFUSD Bond Oversight committee. He also speaks Mandarin. Derrick Eva has a child at Charles Drew and lives in Hunters Point. He has been involved in the school’s parent group and on the SSC, and is active in the Bayview/Hunters Point communities as well as working on school and district initiatives. Kelly Huang has a child at RL Stevenson Elementary School. She lives in Visitacion Valley and is involved with the Vis Valley Parents Association. Her primary language is Cantonese. Milena Levitin has a child entering Kindergarten at the new Dianne Feinstein Elementary School. She lives in the outer Sunset, and is active with the Russian immigrant community. She is bilingual in English and Russian. Jenny Mai has children at Lincoln and Lowell high schools. She lives in Visitacion Valley and is involved with the Vis Valley Parents Association. Her primary language is Cantonese. Emily Murase is the PAC’s Secretary. She has a child in the Japanese Bilingual Bicultural Program (JBBP) at Rosa Parks Elementary School. She is a product of San Francisco public schools and has been active with the JBBP for many years. She is bilingual in English and Japanese. Cecilia Roman has a daughter at Leadership High School and two in college. She lives in the Excelsior and is bilingual English/Spanish. She has been a leader at her children’s schools for years, and has been on SSC and ELAC committees at several schools. Donna Smith has a grandson at Aptos Middle School, and lives in the Excelsior. She has been involved in developing leadership among public school families for many years. She has been on the district’s Title I advisory committee and is a Parent Liaison at Balboa High School. Kate Steinheimer is the PAC’s Chairperson. She has a child at Grattan Elementary, and lives in the Haight. She has been involved with Grattan’s parent group as well as the SSC, and has worked with the SFUSD’s committee on food and nutrition. Luis Vasquez-Gomez has a son in middle school at San Francisco Community, where he is been involved as a volunteer. He lives in the Mission District and is bilingual English/Spanish. Joanna Warrens is the PAC’s Parliamentarian. She has a son at Sunset Elementary, where she is an active volunteer. She lives in West Portal, and has served on the San Francisco Civil Grand Jury. On the first day of Congresswoman Nancy Pelosi's tenure as Speaker of the House, hundreds of Asian American and peace activists held a die-in and rally at the San Francisco Federal Building highlighting a National Day of Action to support Lt. Ehren Watada for his pre-trial hearing for resisting the 'illegal and unjust' war on Iraq. Above - Reverend Lloyd Wake calls for support for Watada and to bring the troops home now. Sacramento activists Andy Noguchi and his daughter accompany Rev. Wake at the rally. Campaign for Justice [for Japanese Latin Americans] activist leader Grace Shimizu, longtime peace activist Ying Lee Kelly, NCRR and Watada Support committee activist Mike Tsukahara and dozens of others participate in the die-in at the doors of the chilly SF federal building. Global Exchange and Code Pink Founder Medea Benajamin leads the chant - "Money for Schools and Education, Not for War and Occupation. " Benjamin, Rev. Dorsey Blake, AFSC Director Steven McNeil and others challenged Pelosi to "de-fund the war" and bring the troops home now. The die-in and rally were organized by the Watada Support Committee, APIs Resists!, Declaration of Peace, First Unitarian Universalist Society of San Francisco, American Friends Service Committee, Buddhist Peace Fellowship, Episcopal Peace Fellowship and San Francisco Friends Meeting. One of the Bravest folks of the year is Lt. Ehren Watada, the young Asian American Army officer resisting what he calls an "illegal and immoral" war. He is the first commissioned officer to publicly refuse deployment to Iraq. For refusing to participate in the war, Lt. Watada is facing 6 years in prison and a military court martial on Feb. 5, 2007 and a pre-trial hearing on Jan. 4, 2007. Now is the time to show your support for this courageous young man. The Watada Support Committee and APIs Resist! and others are organizing events today in San Francisco, including a walk from JapanTown to the Federal Building with a 1pm 'die-in' on the steps. 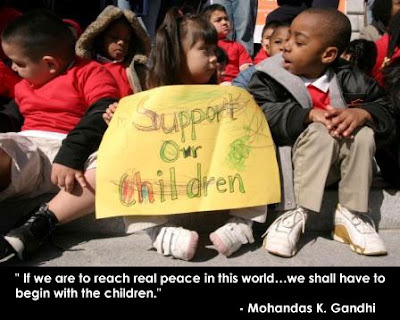 Our local events coincide with the Declaration of Peace and others' National Day of Action to support Watada. Join the Watada Support Committee and APIs Resist! at the JAN. 4 - VIGIL & "Die-In"
WHILE HUNDREDS OF THOUSANDS ARE DYING IN THIS SENSELESS WAR! NO MORE FUNDING FOR THE KILLING AND DYING AND WAR AND OCCUPATION IN IRAQ! In remembrance of the 3000 US soldiers and over 650,000 Iraqis who have died during the Iraq War, participants will lie down blocking the Federal Building doors and cover themselves with white sheets in lieu of shrouds with the message, “No business as usual while the killing and dying continue in Iraq. PLEASE JOIN US! Support Lt. Watada--Refuse Illegal War! To me, Lt. Watada is a modern day Frank Emi, a tremendously courageous individual standing up for his rights in the midst of tremendous racism and repression. Frank was a leader of the Fair Play Committee, a group formed in the U.S. concentration camp at Heart Mountain, Wyo. during World War II. 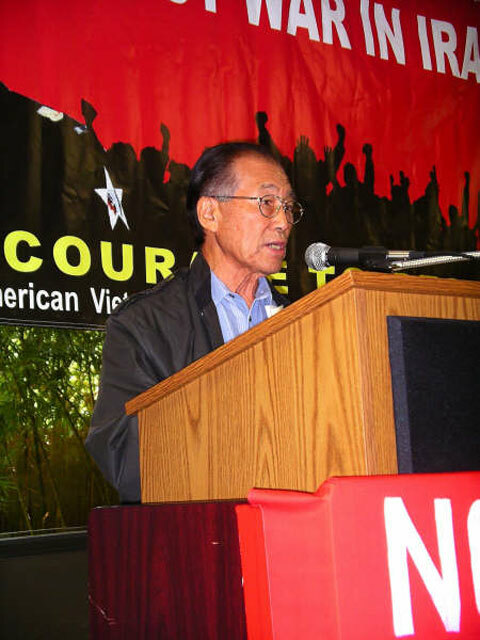 He and 85 other Japanese detainees refused induction into the U.S. armed forces to protest the incarceration of Japanese Americans during the war. Ironically Frank had an 18-month old toddler at the time and would not even have been drafted. Emi and six other leaders were convicted of conspiracy to evade the draft and of counseling others to evade the draft.They spent a total of 18 months in jail before an appeals court overturned their conviction. The other draft resisters also served time and were eventually pardoned by President Truman. Frank stood up for his community and for his constitutional rights during WWII. Lt. Watada needs our support today as he stands up to resist the illegal war on Iraq. Emi and other Fair Play Committee members are featured in the documentary, "Conscience and the Constitution," by Frank Abe - http://www.resisters.com/ - and in local SF filmmaker/cinematographer Emiko Omori's beautiful film Rabbit in the Moon.